Ever since I’ve gotten here, there’s one thing I’ve been craving for: clotted cream and scones! That’s technically two things but the one doesn’t, cannot, shouldn’t go without the other! So yesterday we finally made it to Tesco and I got it all. And guess what I’m doing right now while I’m writing? 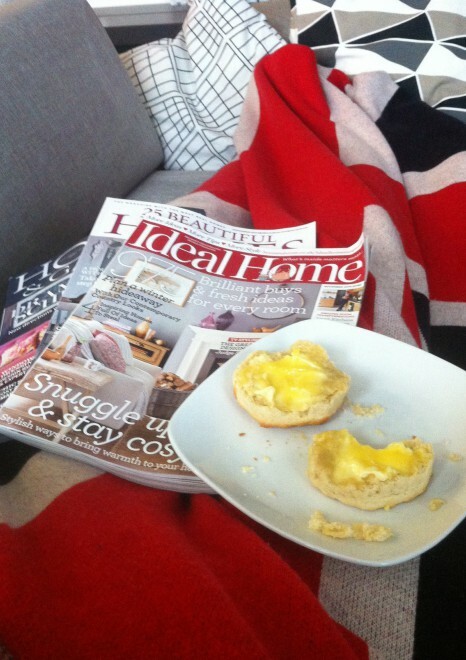 I’m eating those delicious scones with rich lemon curd and heavenly clotted cream, snuggled up in a Union Jack blanket on the couch, drinking the most intense peppermint tea I’ve ever had and enjoying some home magazines- so, so GOOD!